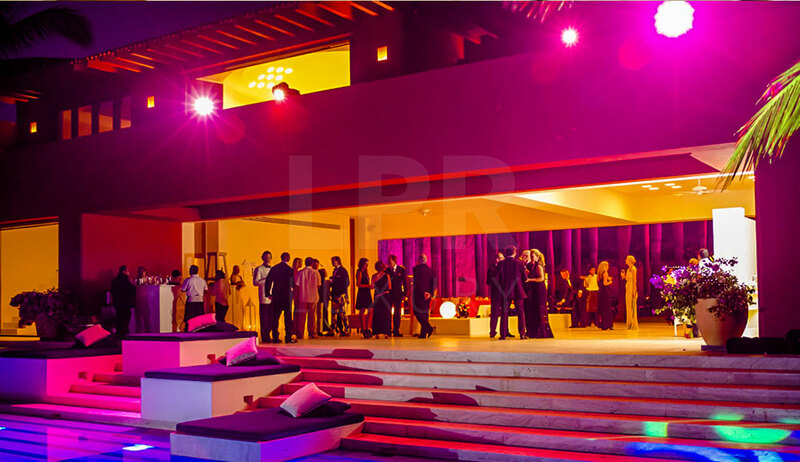 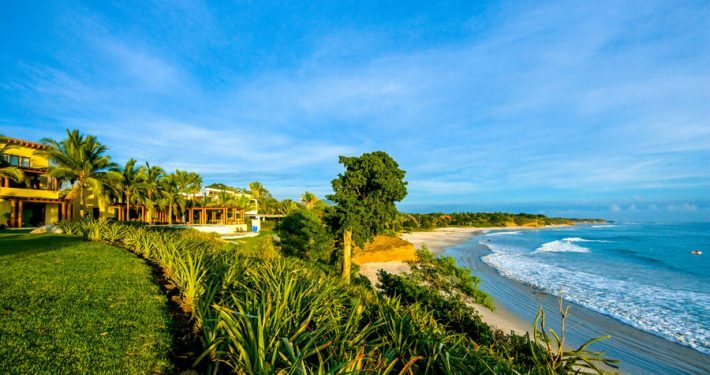 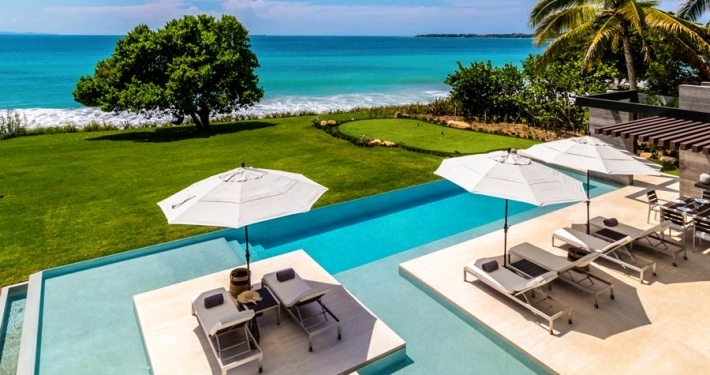 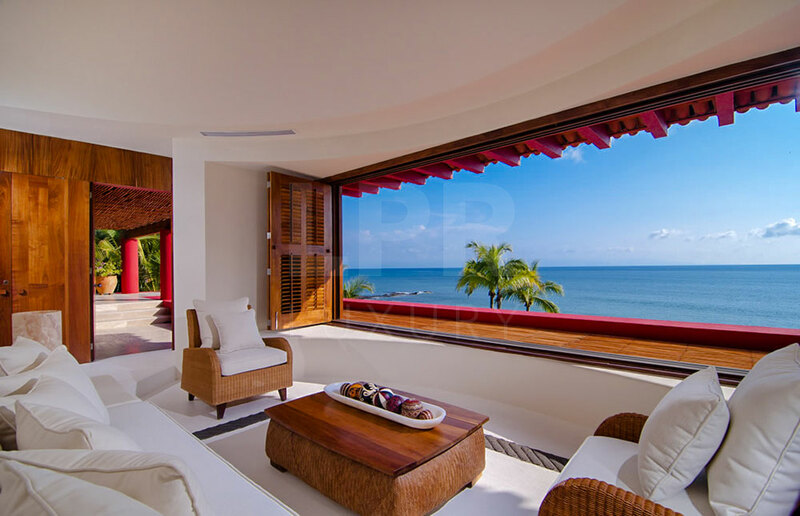 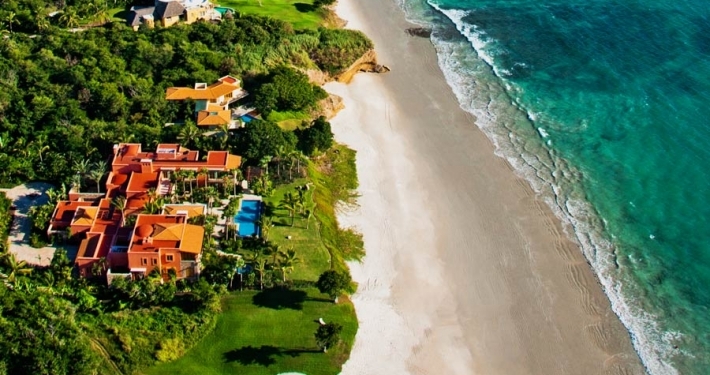 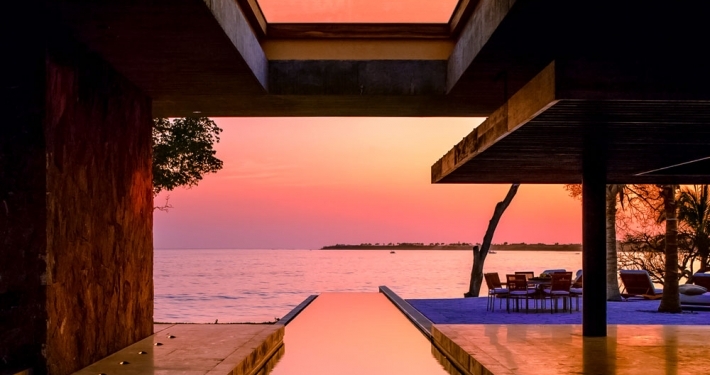 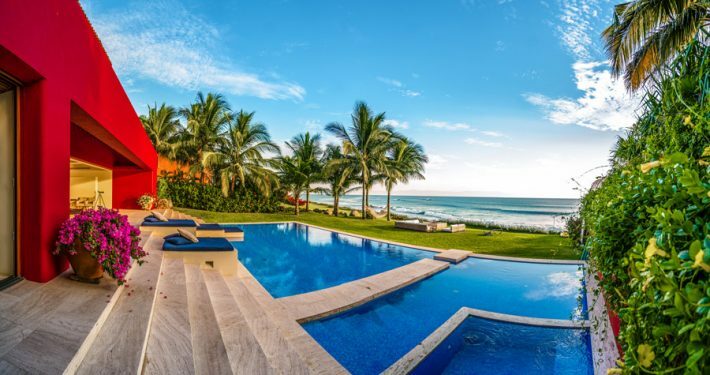 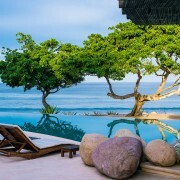 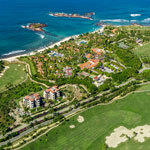 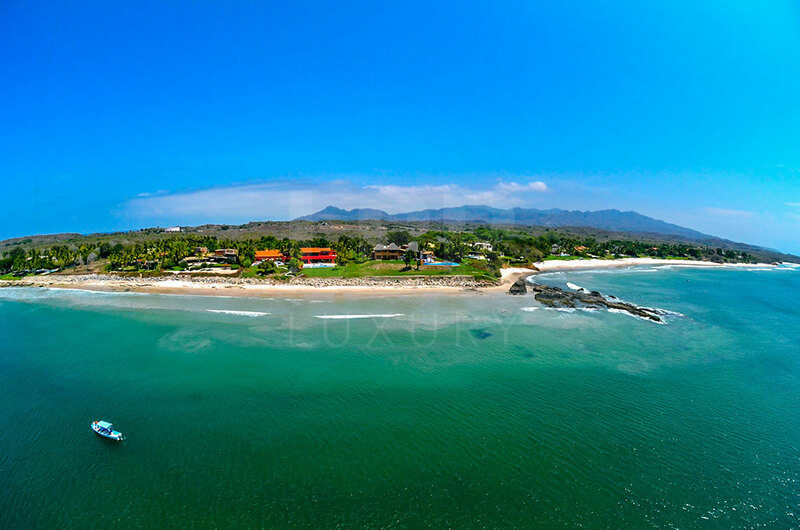 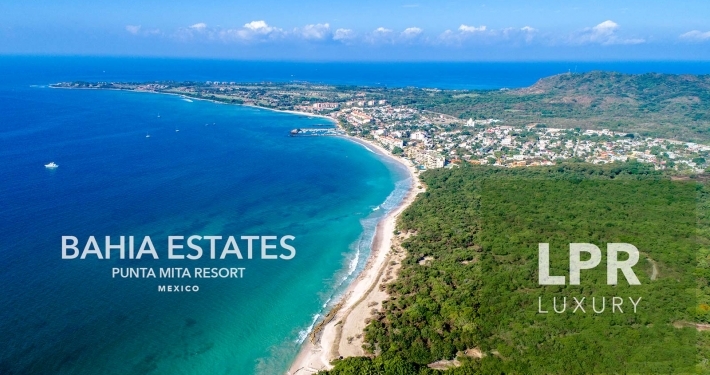 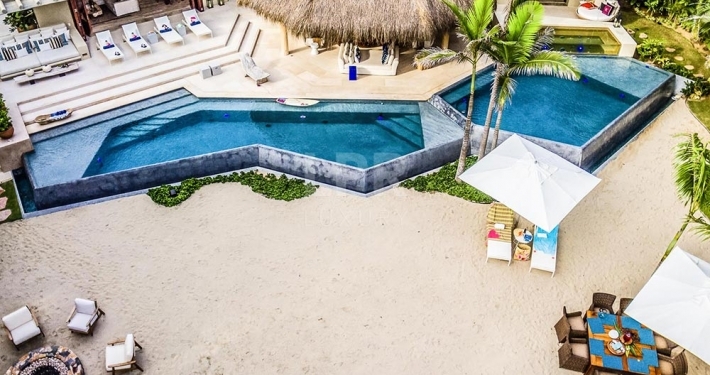 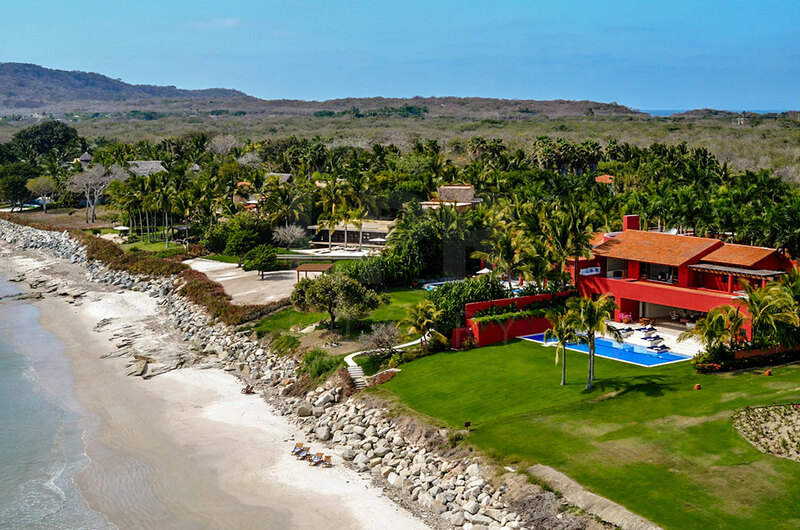 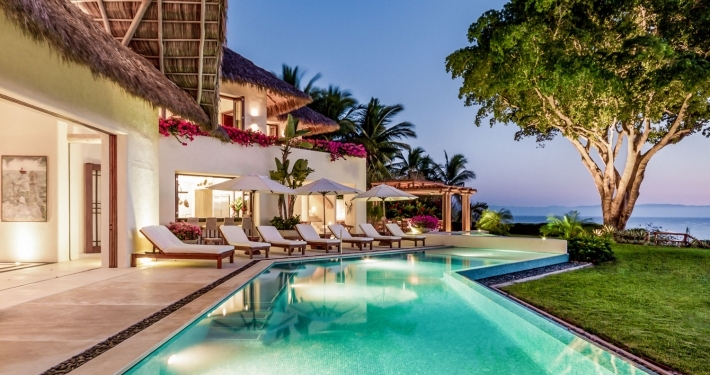 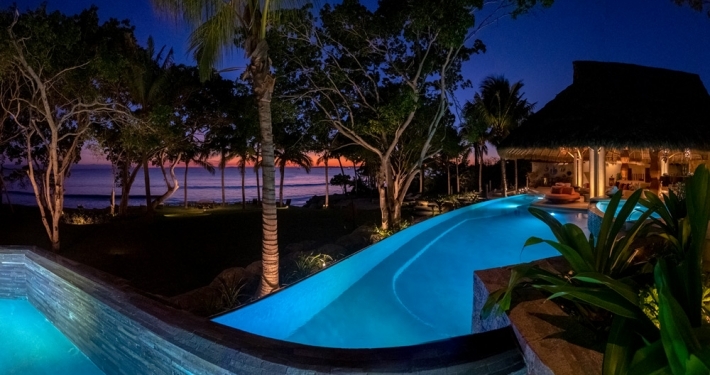 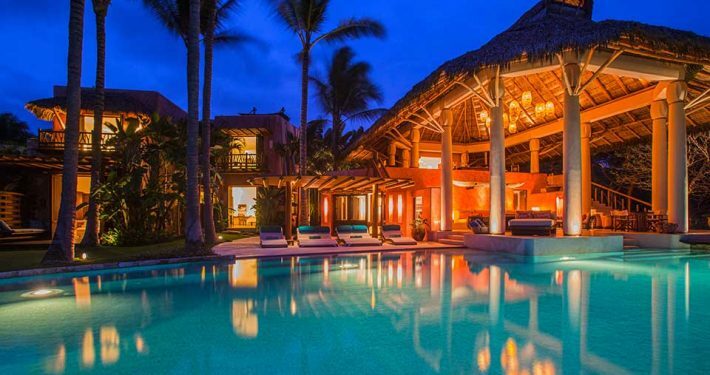 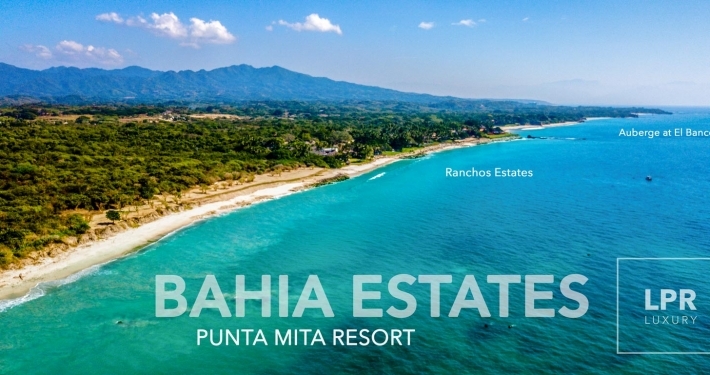 This stunning 11,000 square foot compound is perched a few steps above the Ranchos Estates private beach and seamlessly blends stylish, sophisticated design with the beautiful natural surroundings of Punta Mita. 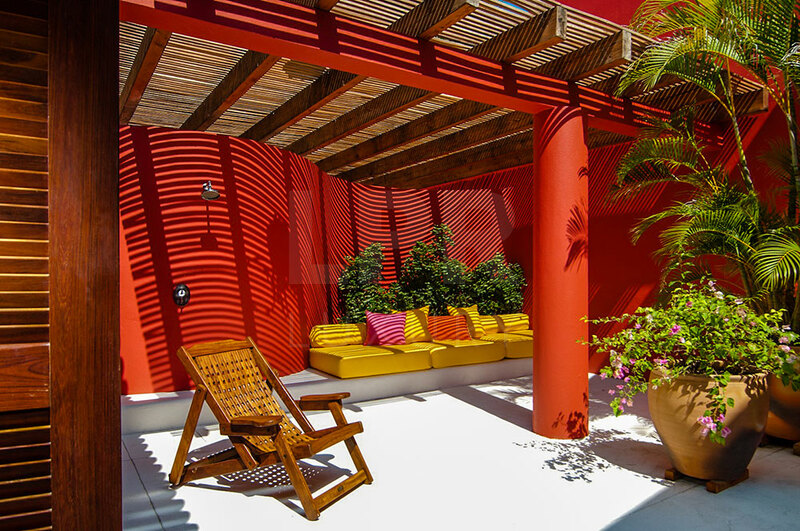 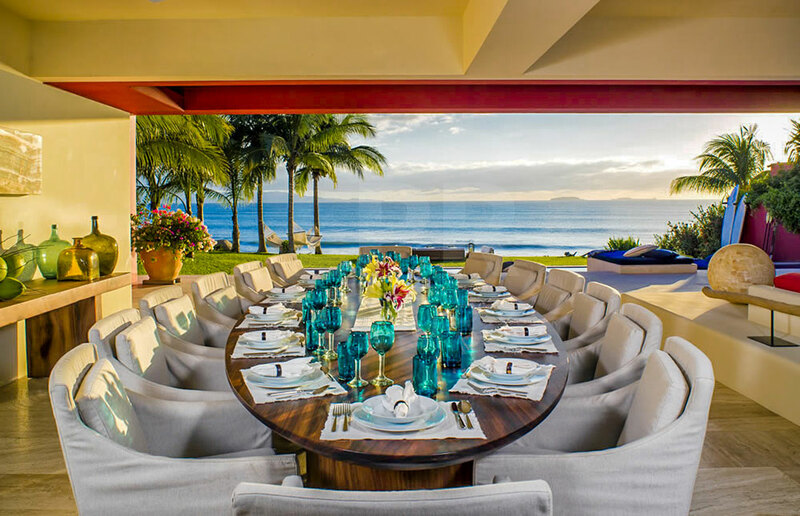 The villa is decorated with the highest grade furnishings and fabrics characterized by chic, relaxed décor, accentuated with bold, contrasting shades of Mexican colors. 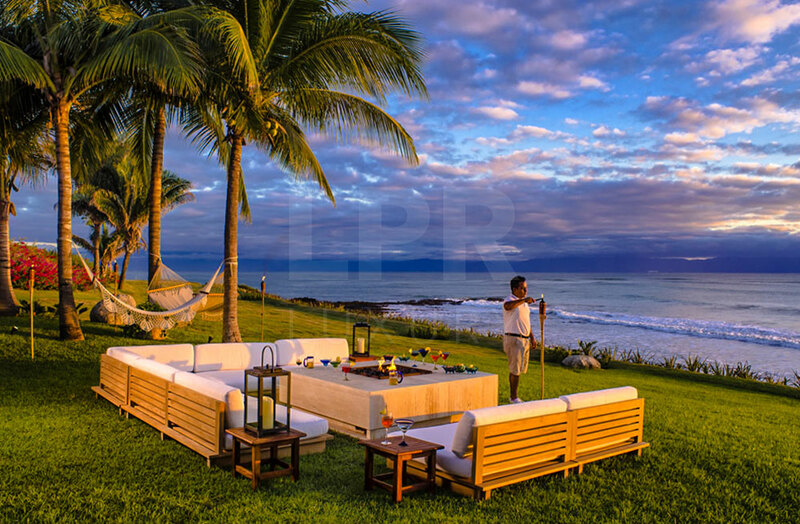 Villa Ranchos 9 is fully staffed with a house manager and an on site housekeeper, chef and butler for your Punta Mita stay. 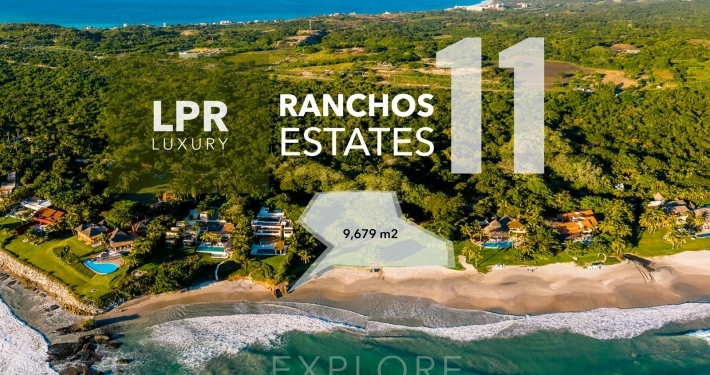 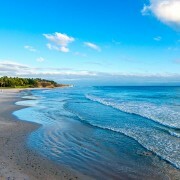 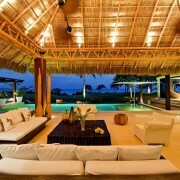 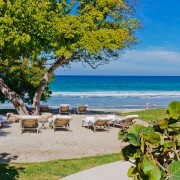 From the moment you arrive at Villa Ranchos 9, any stresses that you may have bought with you will instantly melt away. 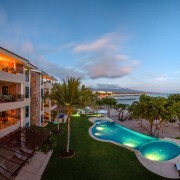 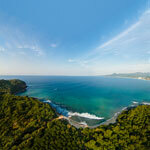 Friendly, attentive villa staff will greet you with fresh made margaritas and whisk away your luggage to your room. 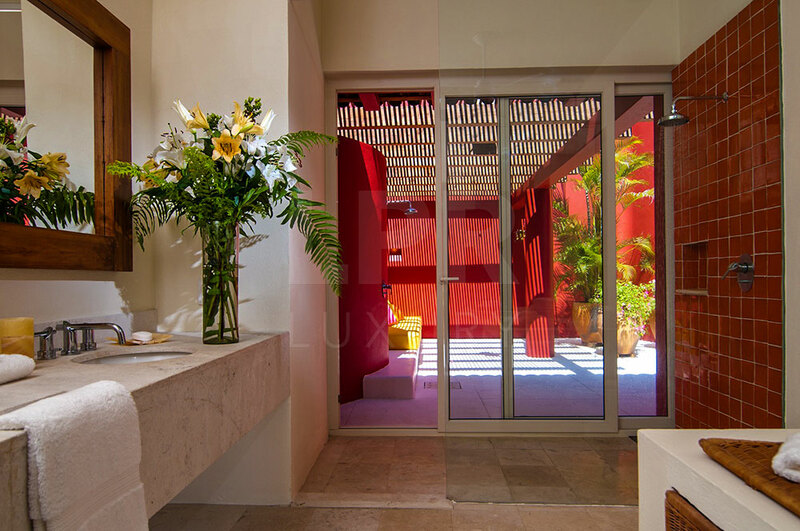 Guests enter the compound through massive wooden doors and enter through a lush tropical garden that features a half moon pond, palm trees and an expansive grass area. 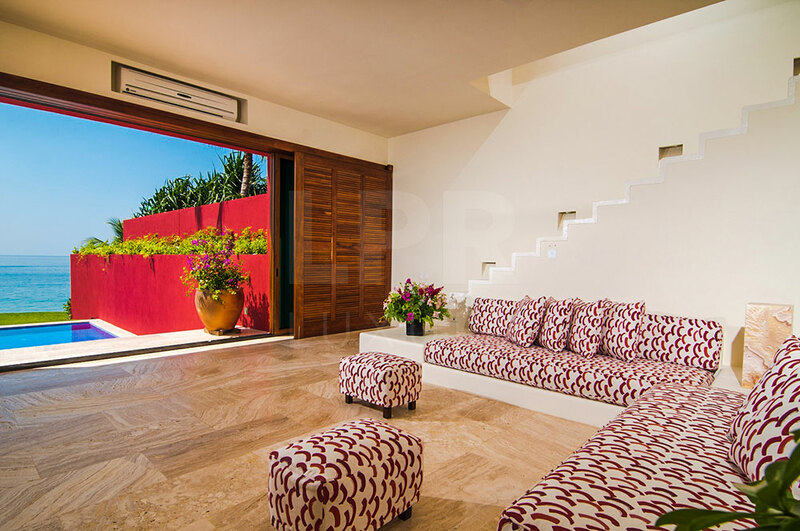 Following the Mexican pebble walkway thought the garden you arrive at the villa entrance and proceed down a beautiful travertine walkway. 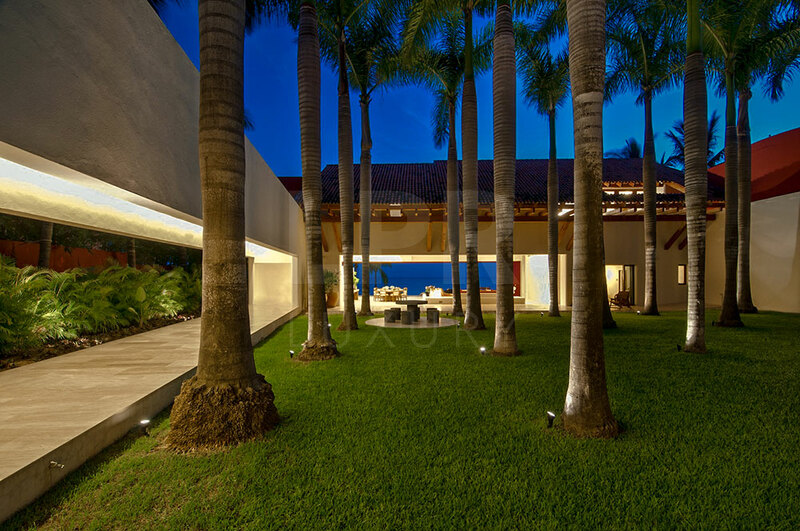 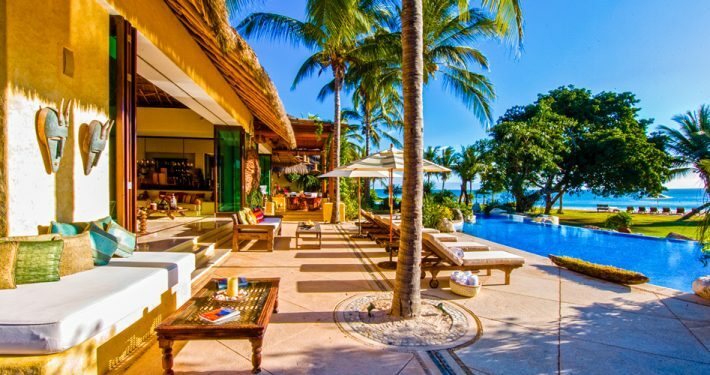 To the right of the walkway is a huge royal palm courtyard that looks through the main living area to the ocean. 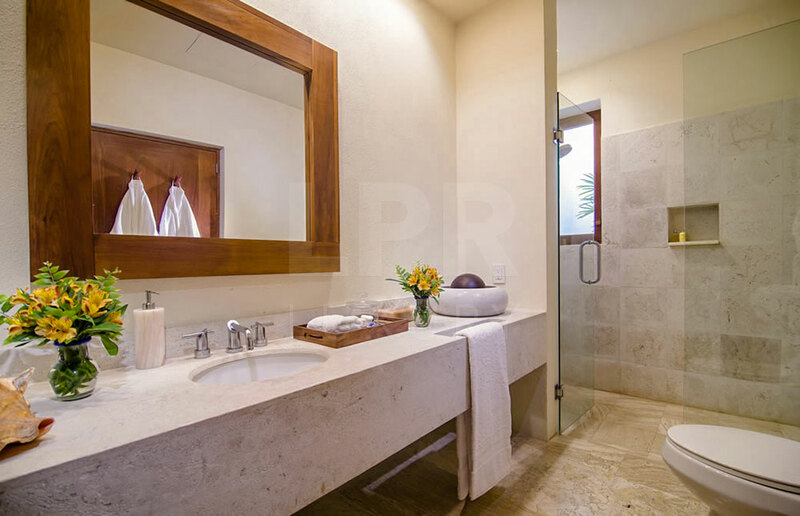 The travertine walkway will bring you to Villa Ranchos 9’s great room. 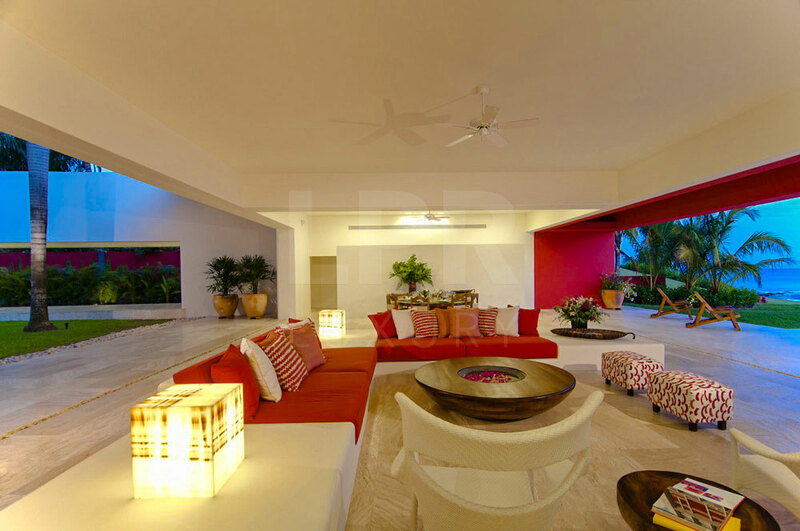 This gorgeous open plan living and entertaining area has multiple seating & dining areas and overlooks the pool and ocean. 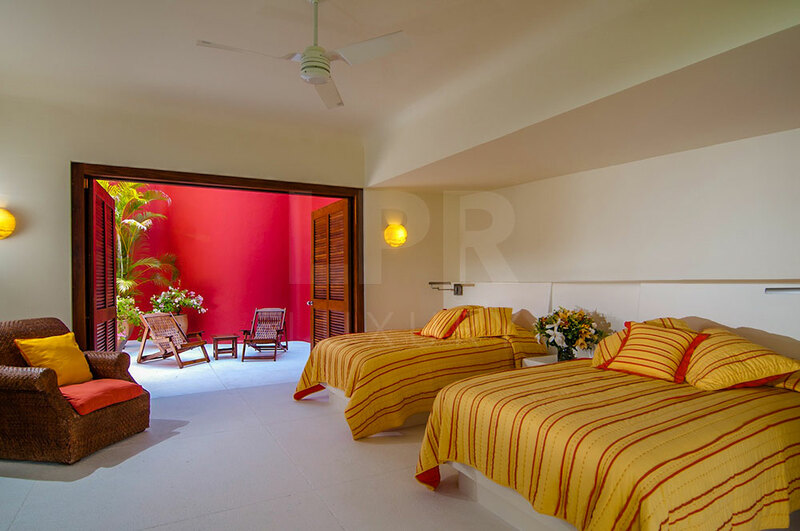 The great room of Villa Ranchos 9 is the center of the Villa, and most likely where you will spend most time. 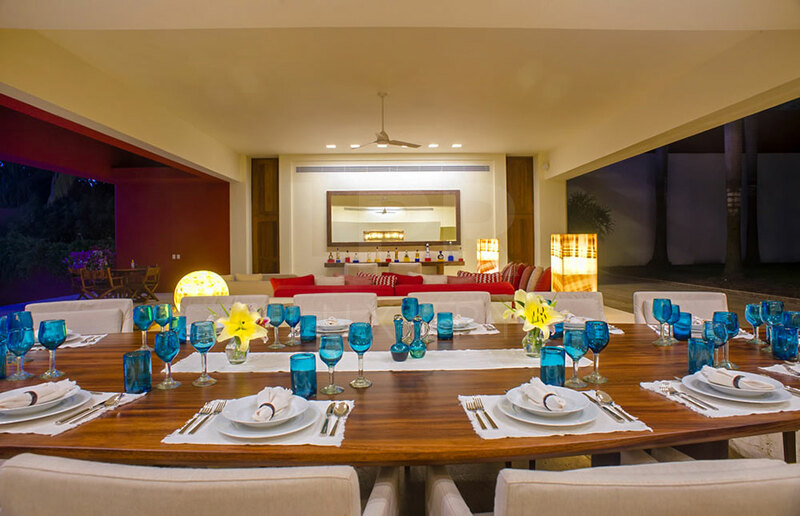 There is a dining table for 10 guests, as well as additional seating for 4 more guests at a separate table. 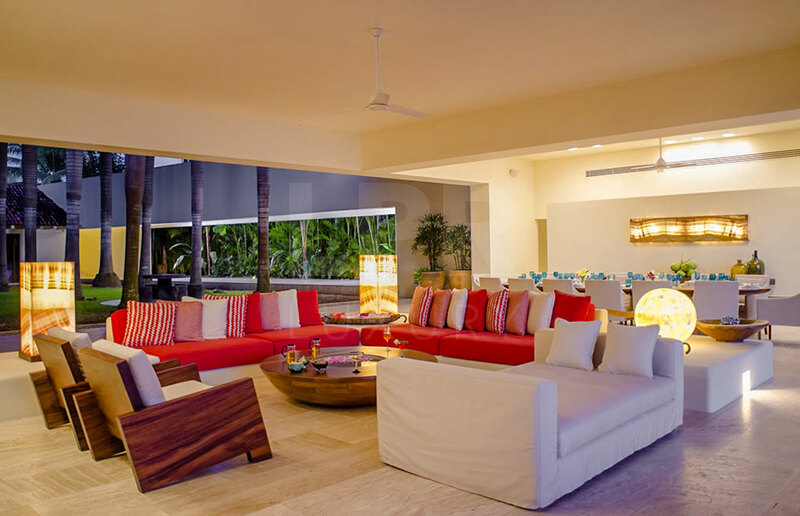 Next to the dining area is the living area with large couches and chairs so that your entire party can be seated together, there in room for 12-14 to be seated comfortably around the main coffee table. 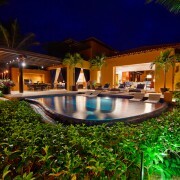 The stairs from the great room lead down to an expansive 22 yard, deep blue pool. 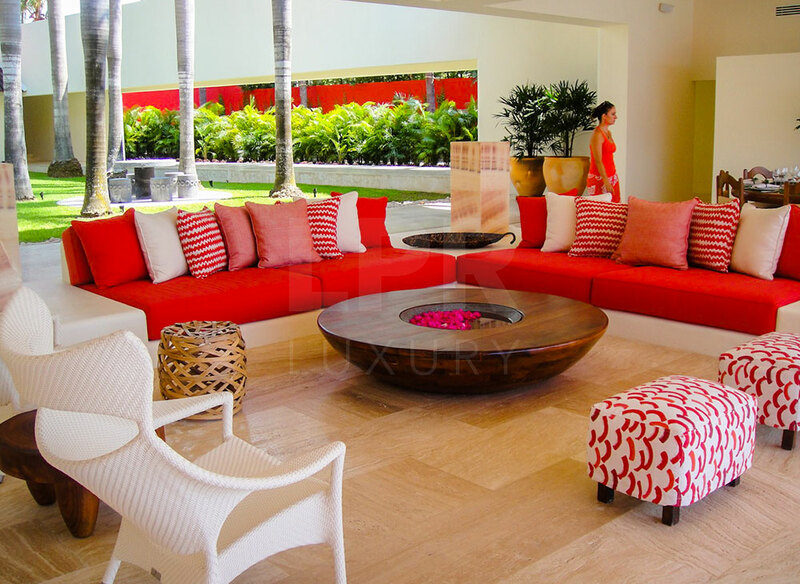 Built into the steps of the pool are 4 queen sized lounge beds that are covered in exquisite outdoor fabrics. 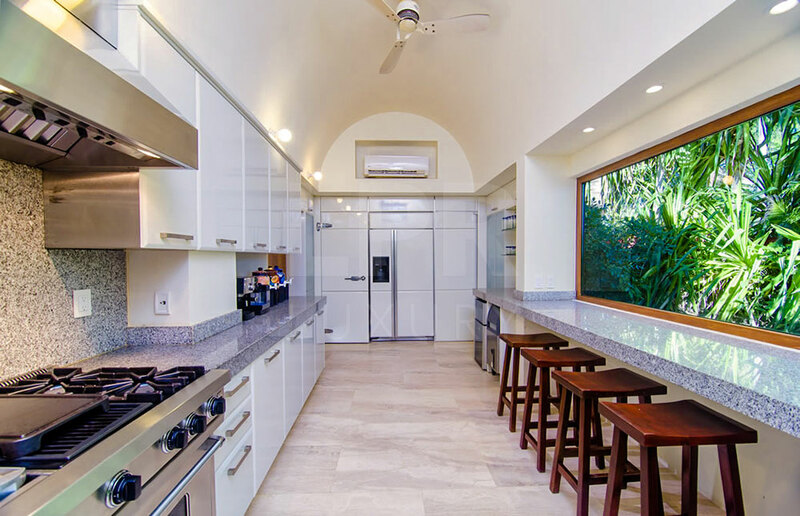 Next to the great room is a modern, white kitchen with a walk in fridge, and stainless steel appliances. 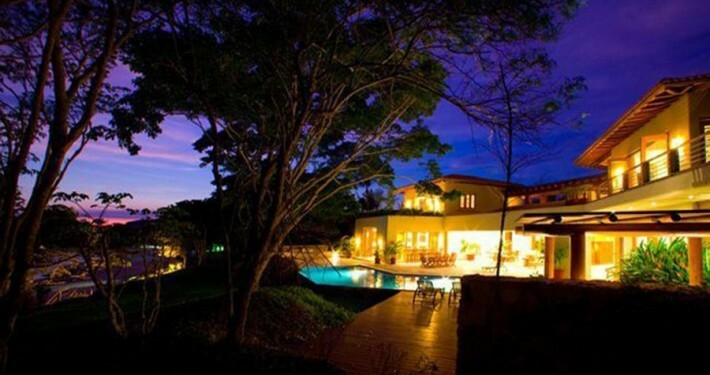 The villa staff to serve you cocktails, snacks and meals. 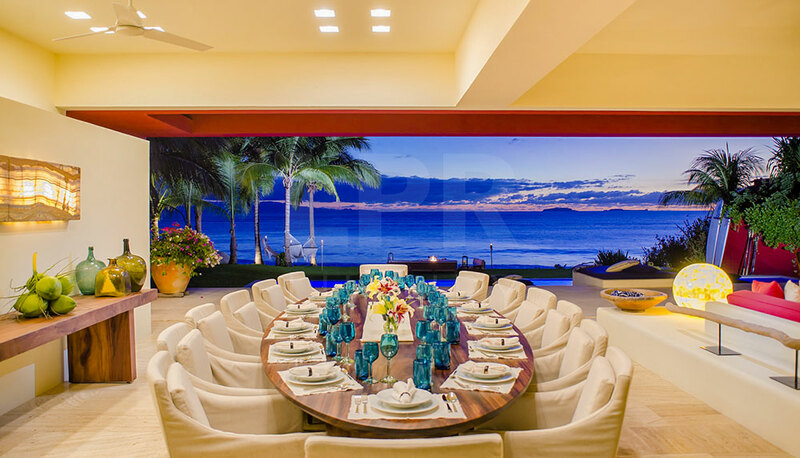 On the other side of the great room is a media room with huge glass doors overlooking the pool and ocean. 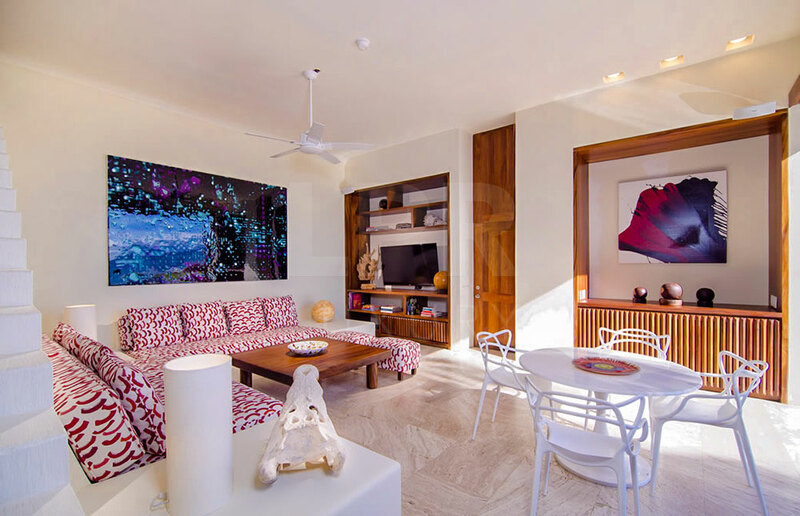 If you are seeking some quiet time out of the sun this media room is the perfect place to watch a movie or do some work. 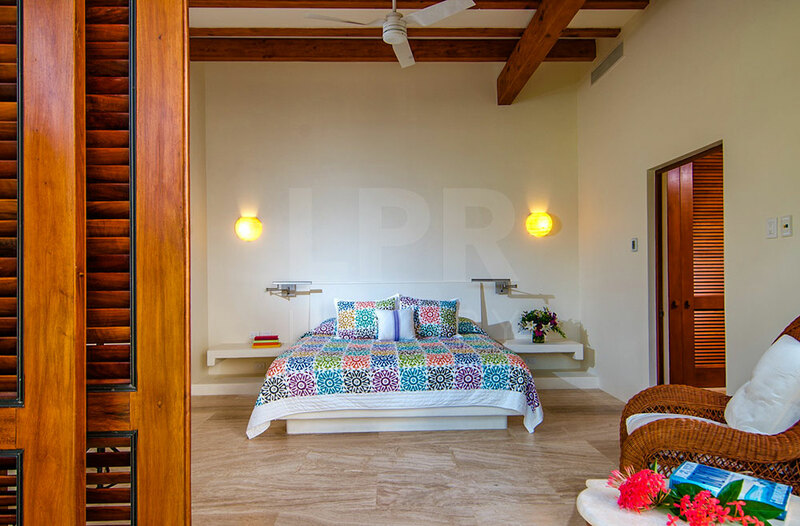 The media room can also be converted into an additional sleeping area with 2 twin beds upon request. 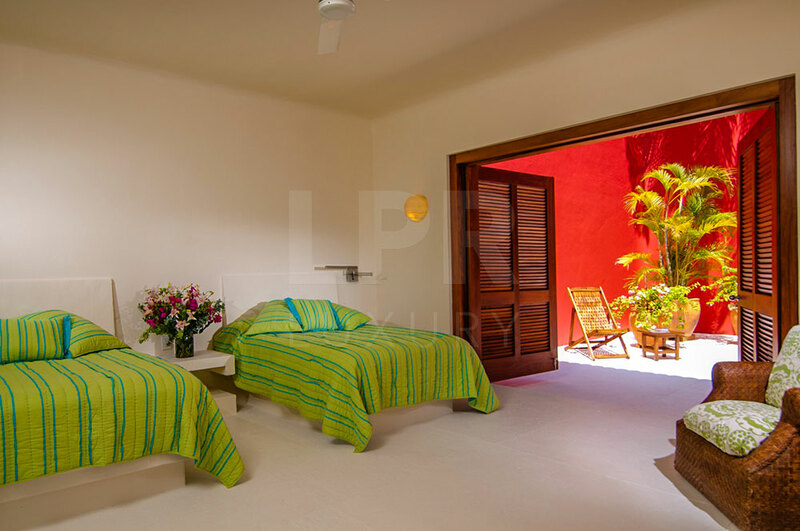 From the media room you walk up some stairs to the top level of Villa Ranchos 9. 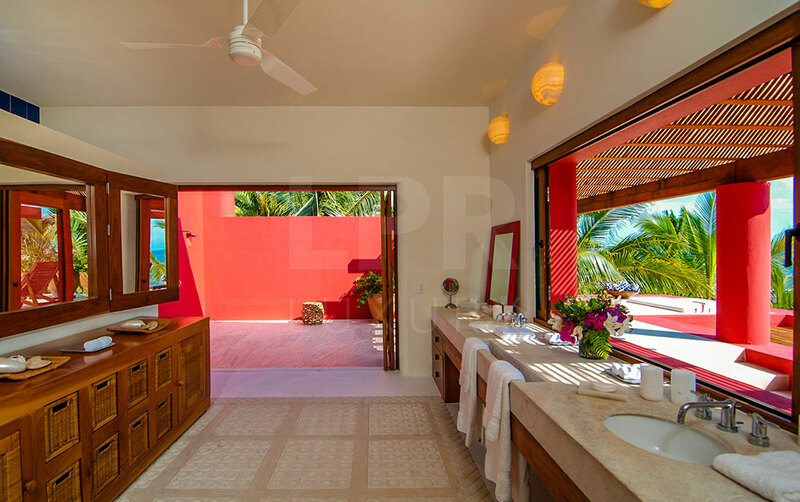 A sweeping, sophisticated master suite occupies the majority of the top floor. 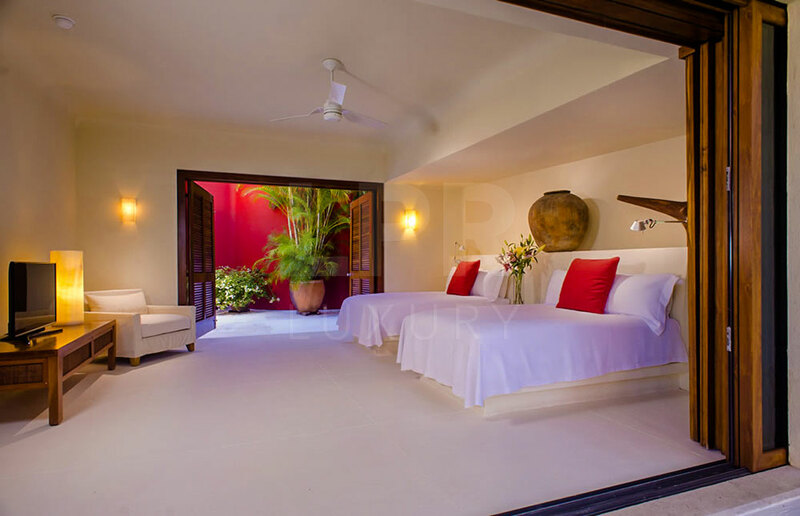 The master suite has a king sized bed overlooking a recessed seating area with elegant furniture. 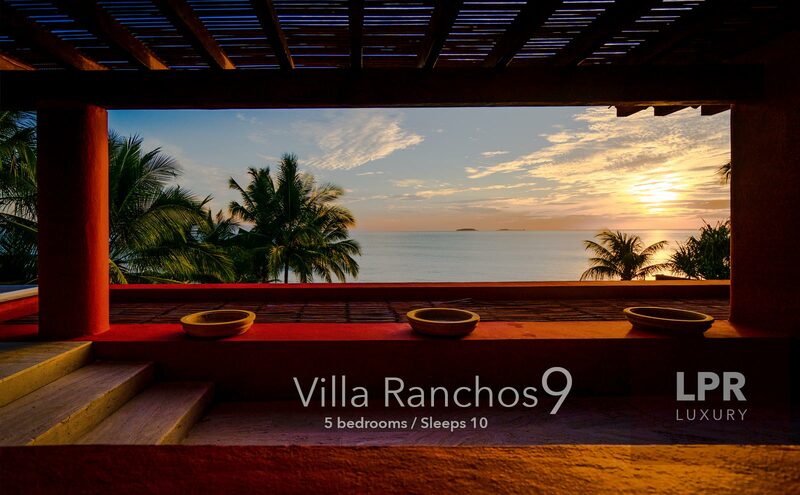 Your stay at Villa Ranchos 9 will leave you feeling refreshed and reinvigorated. 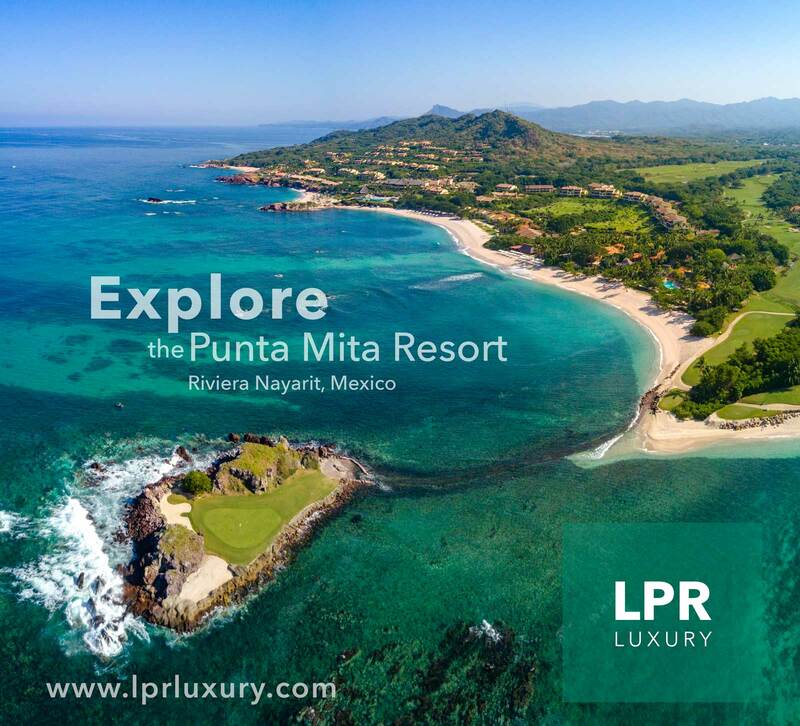 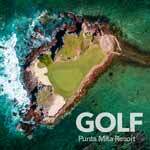 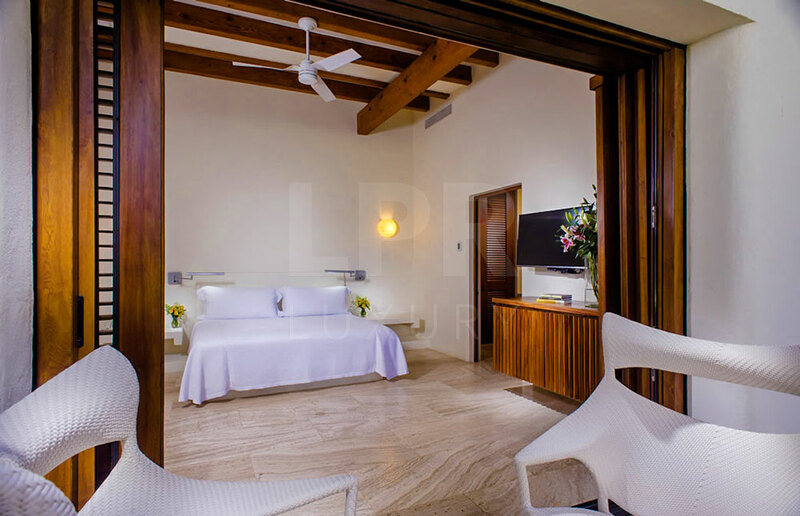 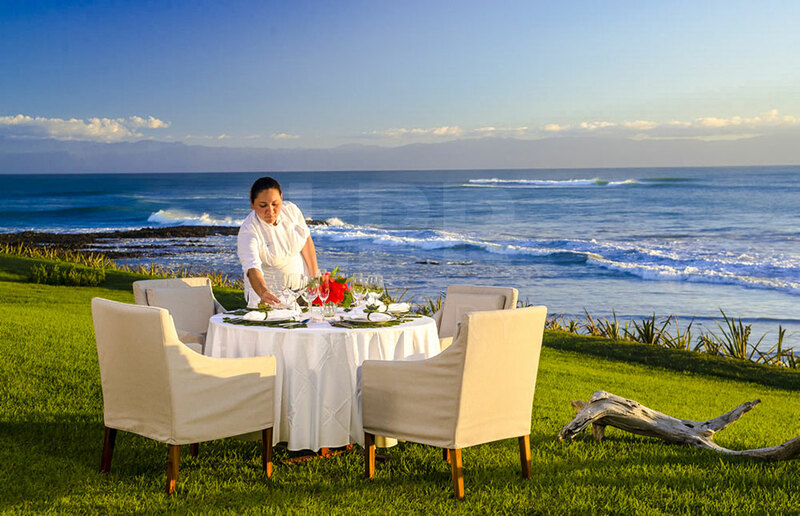 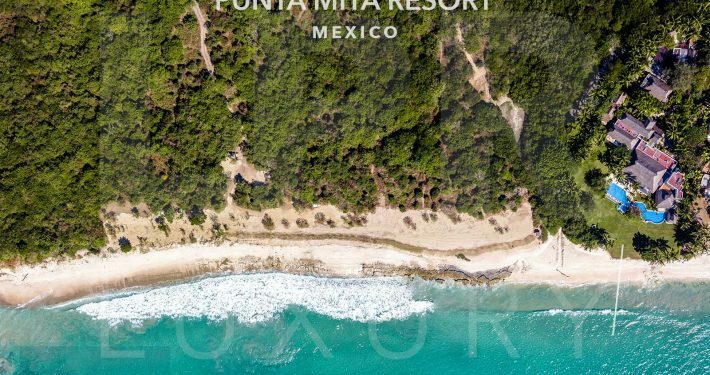 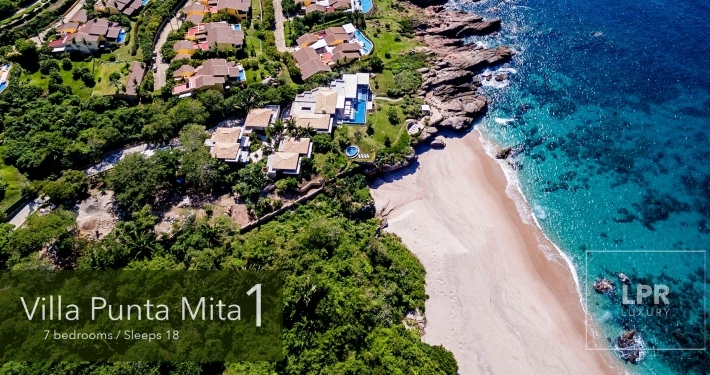 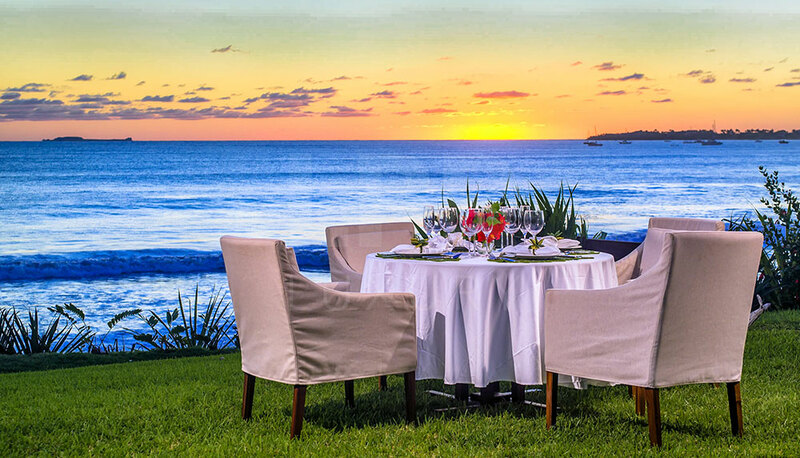 This is a one-of-a-kind vacation rental experience, and we aim to deliver you the very highest levels of amenities and services at Punta Mita’s most exclusive address. 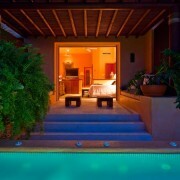 We are very proud that many of our guests return year after year, and we hope that you can become one of them. 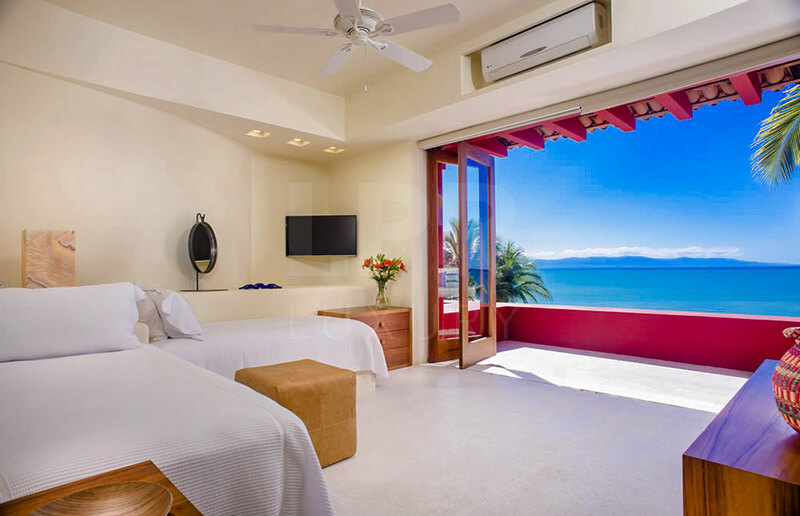 The master suite has big windows that frame uninterrupted views the Pacific and slide into the walls for an open bedroom, it has been called the sexiest bedroom of the Pacific by a well know celebrity. 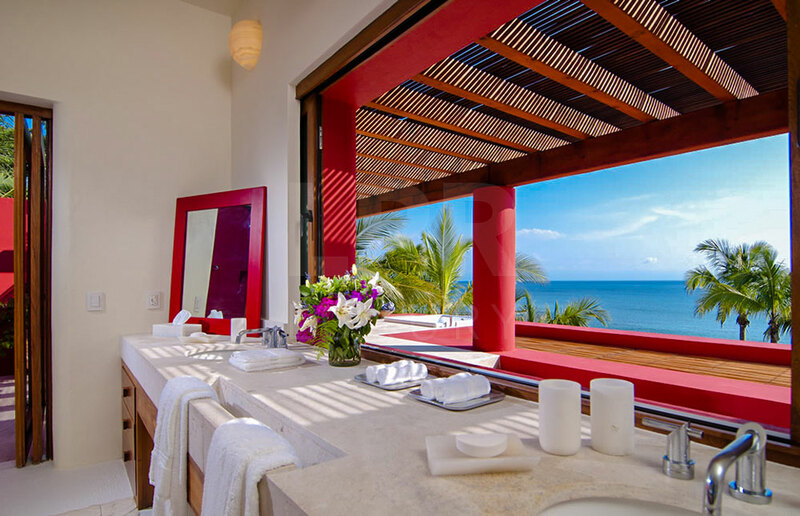 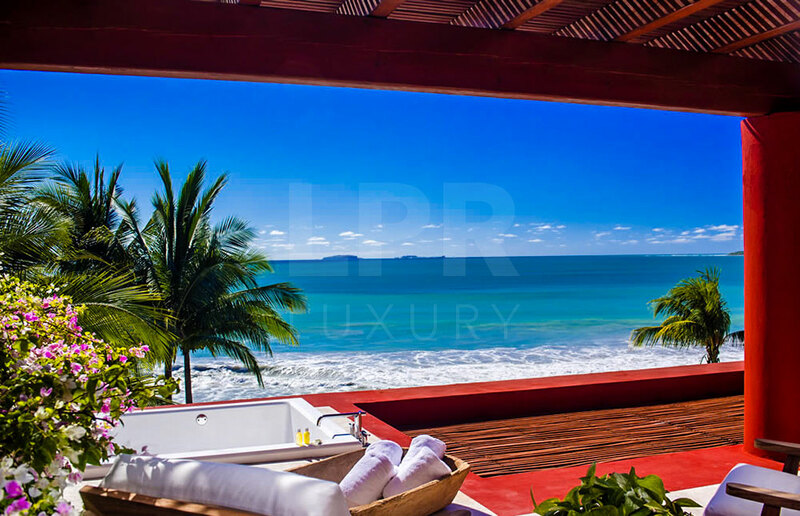 The spacious master bathroom has both indoor and outdoor showers, and a private deck with a sunken tub overlooking the ocean below. 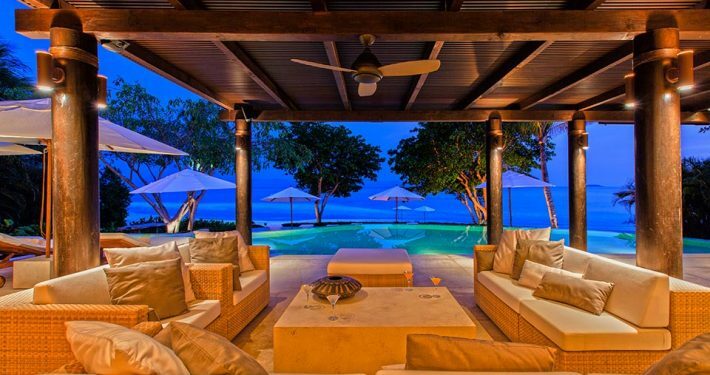 This private space has seating and views. 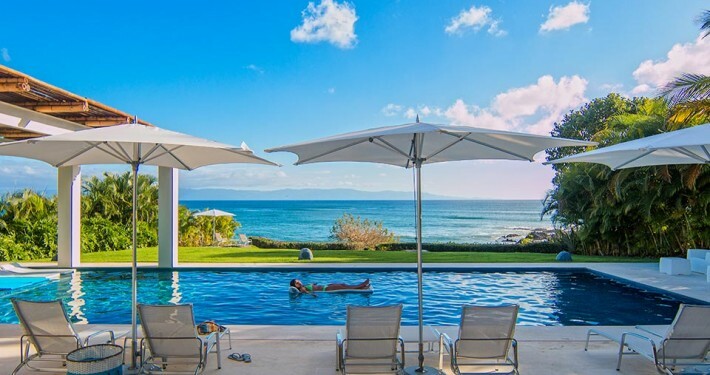 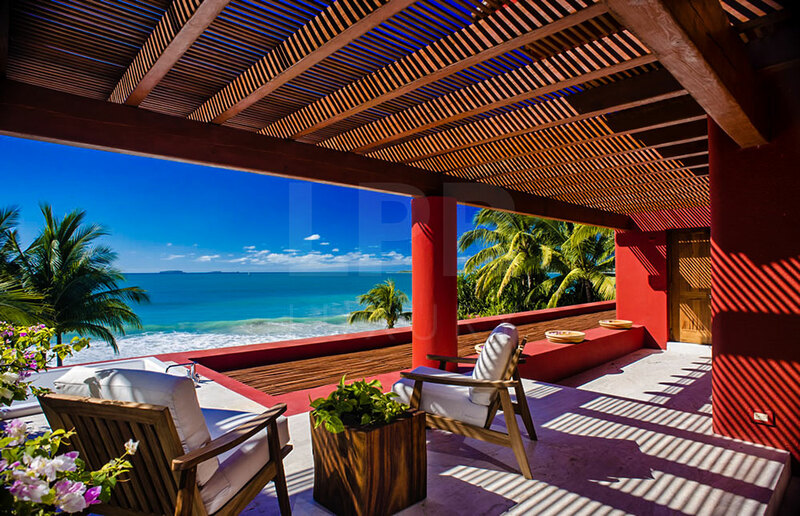 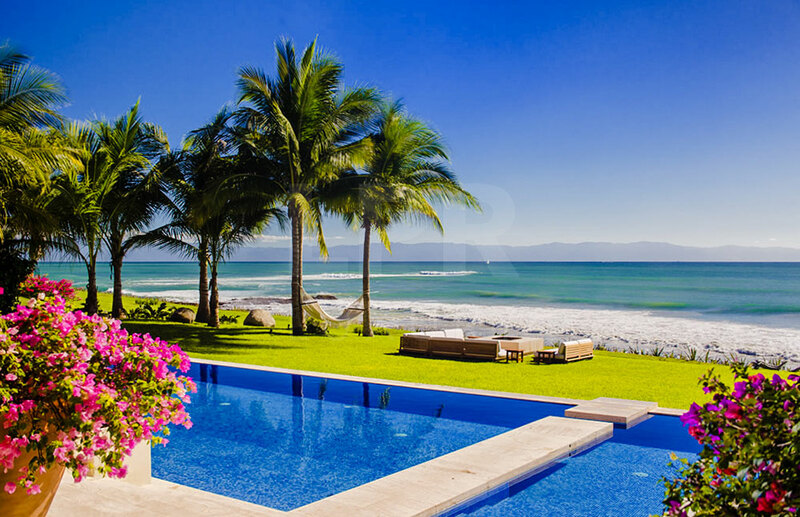 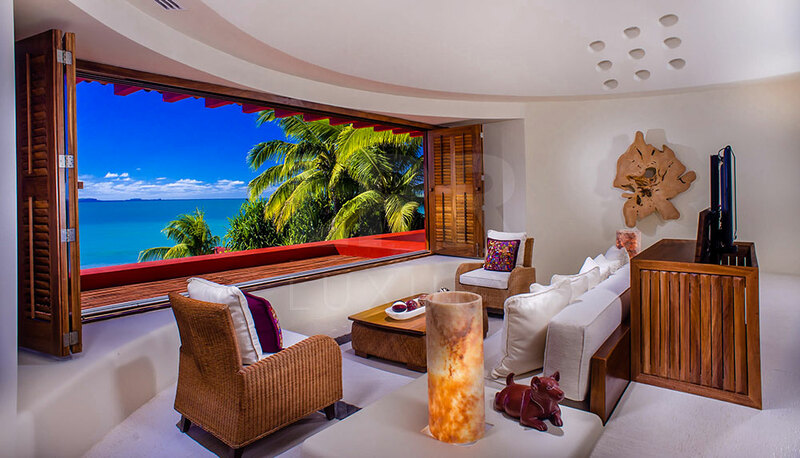 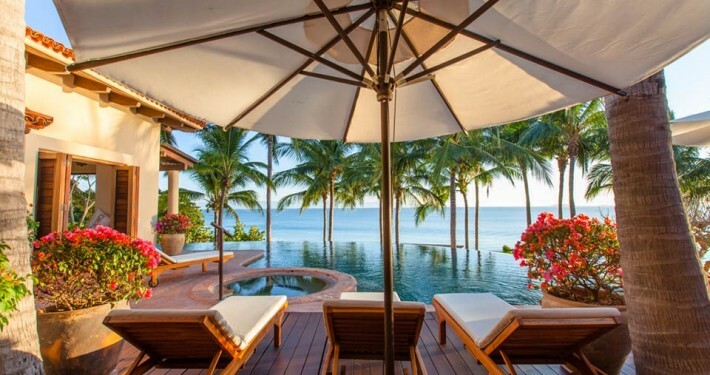 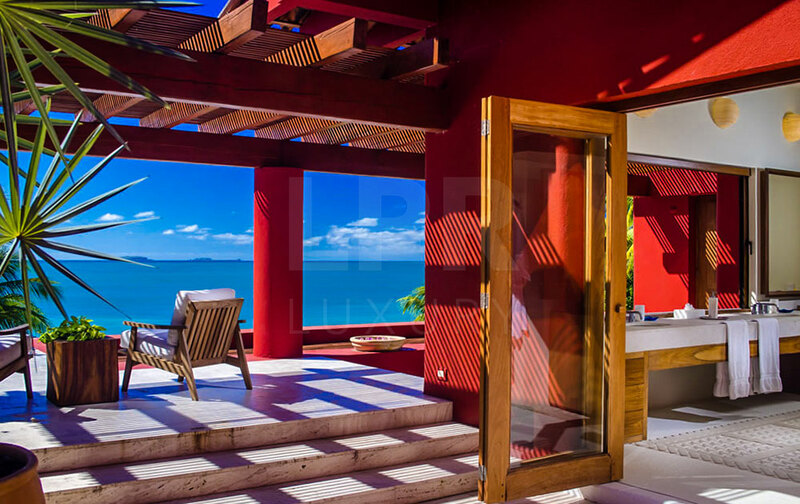 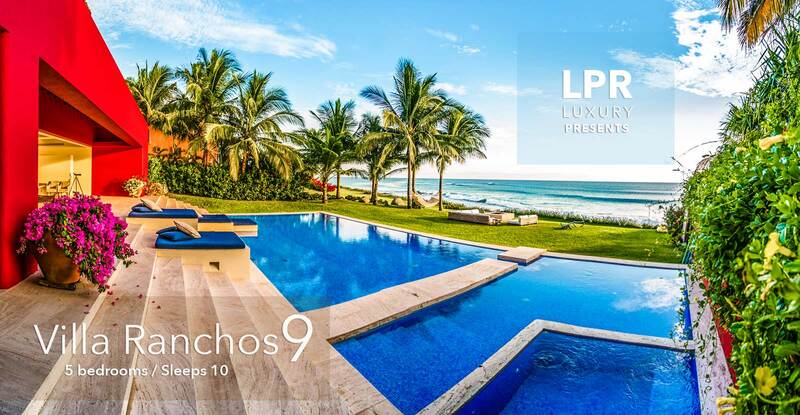 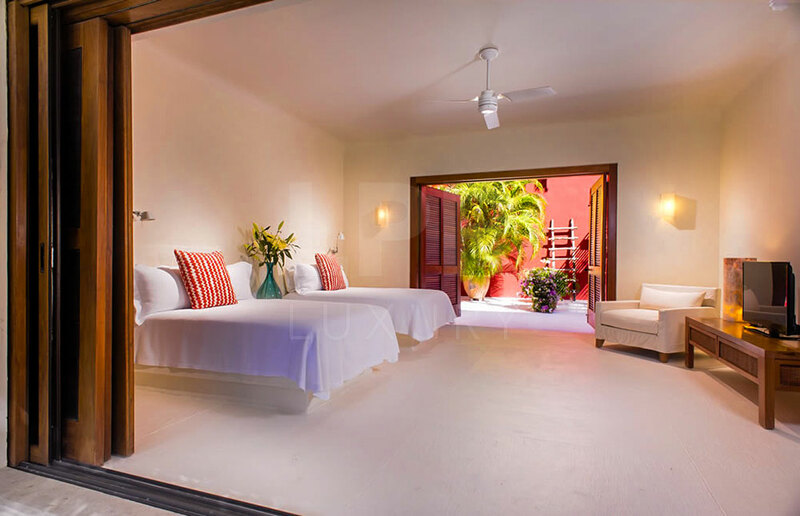 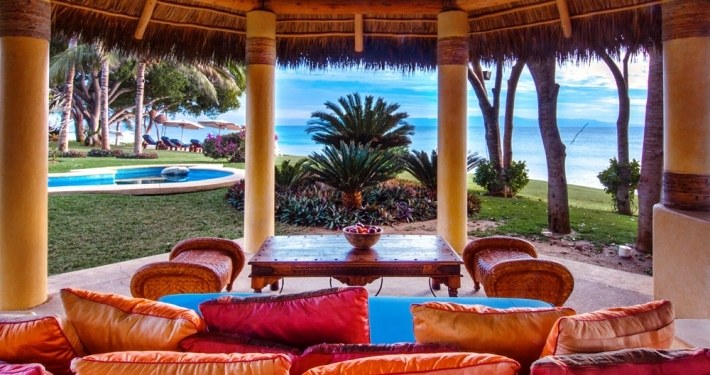 Villa Ranchos 9 was designed to be the ultimate beachfront vacation retreat for family and friends to relax while enjoying the beach, sun , fabulous activities, fine dining and each other’s company. 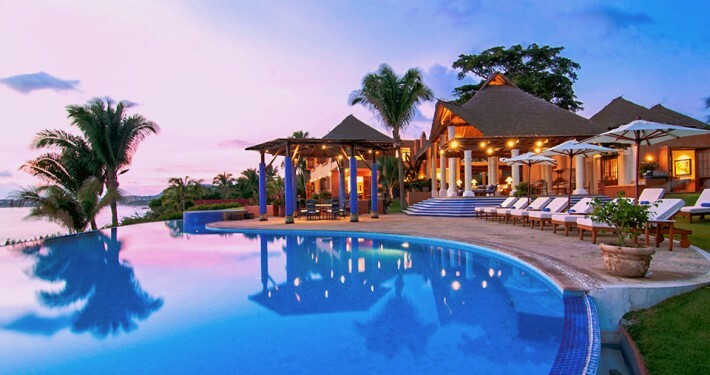 It is a fully staffed, single-client five star luxury retreat managed by our professionally trained staff, where even the person who is most prone to be the planner in your group will have the freedom to take a well deserved vacation. 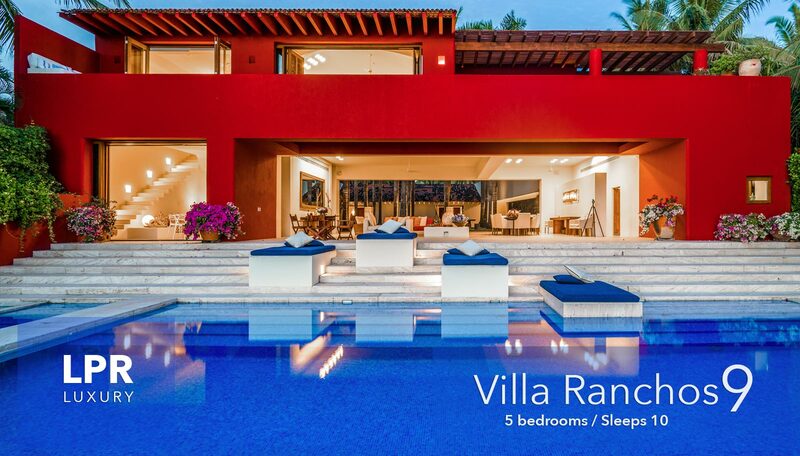 Our hope is that you will surrender to Villa Ranchos 9 staff and let them take care of you, allowing you a brief escape from the cares of the world.